The IRA were tipped off by gardaí with information which proved vital in the plot to murder the two most senior policemen to die during the Troubles, the Smithwick tribunal into allegations of collusion has found. RUC Chief Superintendent Harry Breen and Superintendent Bob Buchanan were gunned down on their way home from a high-level meeting at Dundalk Garda Station in 1989. Questions have long been posed over how the IRA knew enough about their movements to carry out such a detailed plan with deadly accuracy. Decades later, and after an intensive eight-year investigation led by Judge Peter Smithwick, a damning conclusion has been reached - that there was collusion in the case. Robert Buchanan's son William expressed appreciation on behalf of his family for the "diligence and integrity" of the investigation. "The findings are both incredible and shocking and confirm the existence of a mole in Dundalk station. This led to my father's death," he said. Judge Smithwick was tasked with finding answers, however unpalatable, and was scathing of the state for what he feels was putting itself and political expediency over the pursuit of the truth. "This tribunal has sought to establish the truth and, in so doing, I hope that it has contributed one small part in changing the culture." Harry Breen and Robert Buchanan were ambushed by IRA men posing as an Army patrol on the Edenappa Road, in what was known as the 'bandit country' of south Armagh, on 20 March 1989. Having travelled to meet with gardaí in Dundalk, they were unarmed as they were not allowed to carry their weapons over the Irish border. The attack on the two men was planned to such a degree that their vehicle was directed to a specific spot, out of sight of a watchtower, before they were gunned down. Robert Buchanan, a father of two, was already dead when he was shot again in the head. Harry Breen, also a father of two, was badly wounded and waved a white hankie as he pleaded for mercy from the gunmen. None was shown. They shot him dead at close range. The two officers would have been targets for the IRA, as they had been assigned to a joint RUC and An Garda effort to cut off their funding by smashing the huge smuggling operation in south Armagh. An Garda Siochána had refuted allegations that there was a mole within the force, while the IRA denied having been privy to insider information. The intelligence picture seemed to tell a different story though, with conversations recorded by the PSNI during an investigation into dissident republican activity containing claims by former IRA members that gardaí had passed information to the Provisionals. "On behalf of the Government and the people of Ireland, I apologise without reservation to the Breen and Buchanan families for any failings identified in the report on the part of the State or any of its agencies." The Smithwick report was handed to the clerk of the Dáil last Friday and then copies were given to the victims' families on Monday night, with the findings finally made public on Tuesday evening. Irish Tánaiste Eamon Gilmore said he was "appalled and saddened" by the findings and apologised without reservation to the Breen and Buchanan families. "Their murder deprived June Breen and Catherine Buchanan of their husbands, and Gillian and George Breen and Heather and William Buchanan of devoted fathers," he said. I know that members of An Garda Síochána will be shocked by these findings today. "The actions documented in this report are a betrayal of the values and the very ethos of an Garda Síochána, as the guardians of peace." Irish Justice Minister Alan Shatter also apologised. "Even with the passage of 24 years and the positive developments which have taken place on the island since, our condemnation of their murder should be as strong today as it was then," he said. His counterpart in Northern Ireland, David Ford, told UTV: "I don't think you can say because of the possibility that one or two officers sometime in the past were corrupt, that it's a tarnished force. "I think what we can say is that it contains human beings, and things sometimes go wrong with individuals. "But with what I see when I meet members of the gardai, I believe that they are providing a good service for the people of the Republic of Ireland - and also across the border, in terms of cooperation with the PSNI." A statement from the Garda Commissioner welcomed the Smithwick report. It said: "Given the serious matters under examination by the Tribunal, the report, conclusions and recommendations will now need to be carefully examined by the Garda Commissioner and his senior officers and it would be inappropriate to comment further at this stage." Meanwhile the PSNI said it will "take time to study the content of the report in detail". 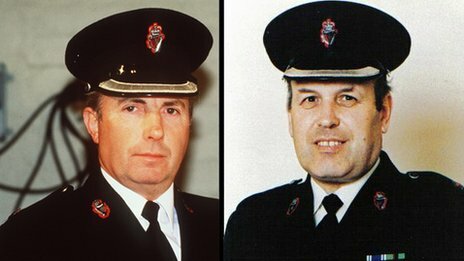 A spokesman continued: "The murders of Chief Superintendent Harry Breen and Superintendent Robert Buchanan are still open. "PSNI has fully engaged with and supported the Smithwick Tribunal and any new evidence that comes to light as a result will be fully considered and assessed." "We would once again express our sympathy to the families of Chief Superintendent Harry Breen and Superintendent Robert Buchanan and appeal to anyone with information to contact police." The Superintendents' Association of Northern Ireland added: "Without doubt, the conclusions of this report will make stark and challenging reading for many people and whilst we recognise this step towards bringing out the truth in relation to these tragic and horrendous murders, what is now important for us is to see how these findings are acted upon." Politicians have also given their reactions to the findings. Speaking to UTV, Gregory Campbell of the DUP said: "The initial reading of this report does appear to be explosive. But many people will say this only confirms what many of us knew." Sinn Féin President Gerry Adams said: "People will make up their own minds on this when they read the report. Sinn Féin supported these inquires on the basis that families had the right to full disclosure of all relevant information. "What Justice Smithwick describes as collusion is very different in form and scale from the collusion that occurred in the north. Sinn Féin believes that there needs to be an effective truth process for dealing with all legacy issues." Dolores Kelly of the SDLP said: "The Smithwick Tribunal took an independent and fearless approach and this should be a measure of how to deal with the past. Judge Smithwick, through a trying process and painstaking work has gotten to the bottom of this tragedy." Tom Elliott of the UUP said: "The Irish Minister for Foreign Affairs said in a recent speech in Cambridge that the Irish Government had to address the perception among unionists that successive Irish governments did not do enough to stop the IRA. "Judge Smithwick's confirmation that it is more than a perception will require the Taoiseach to take the next step to address unionist concerns." Naomi Long of Alliance said: "I welcome the unequivocal apology from Minister for Justice, Alan Shatter TD, as an important step in acknowledging the Irish State's role in these events. Clearly, all concerned will need to take time to reflect on the full findings of the report." Secretary of State Theresa Villiers said: "The report raises some serious concerns which I will need to consider in detail and discuss with the Irish Government. "An important point to remember is that levels of cooperation between An Garda Siochana and the PSNI are now at unprecedented levels and are playing a crucial part in combating terrorist attacks in Northern Ireland.